This was probably the first time I'd been in Glendale for over a decade. We came up to work on a group project for our statistics class at the Disney offices in Burbank, so we decided to head to Glendale for dinner. 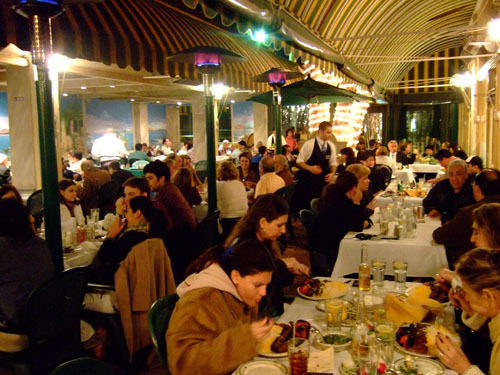 Raffi's is famous for the kabobs and apparently, is a place that every Armenian will know of! Be but forewarned, the place gets crowded. 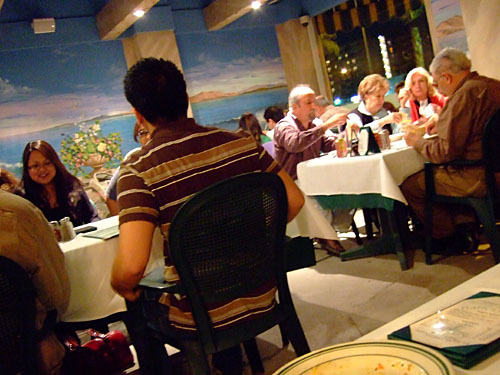 We had about a 40-minute wait for a party of five. 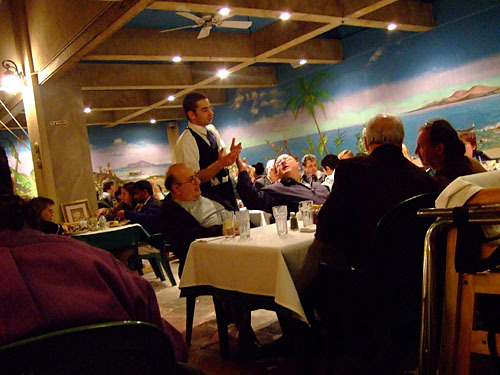 The decor is very quaint and cozy. 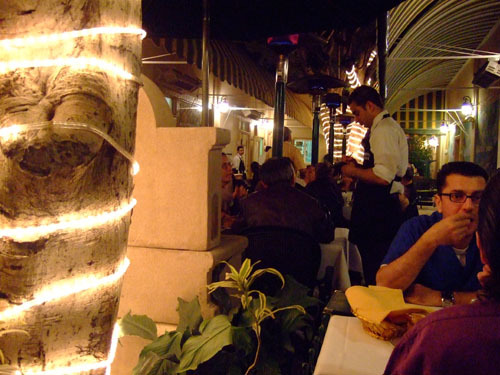 The restaurant has a large outdoor patio area, and a small indoor dining area (not pictured). 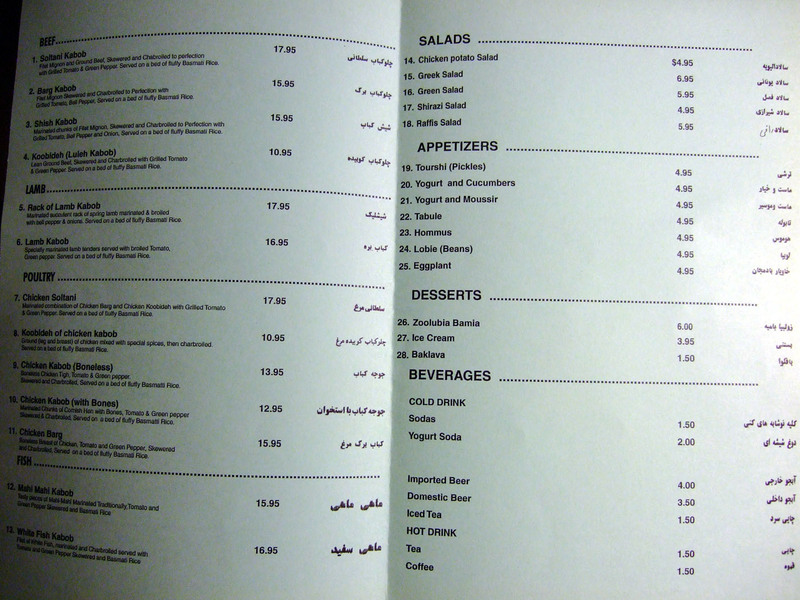 The menu is simple: kabobs on the left, everything else on the right. Click for larger version. Once you sit down, the first things to arrive are basil, mint, and onion slices dotted with parsley. 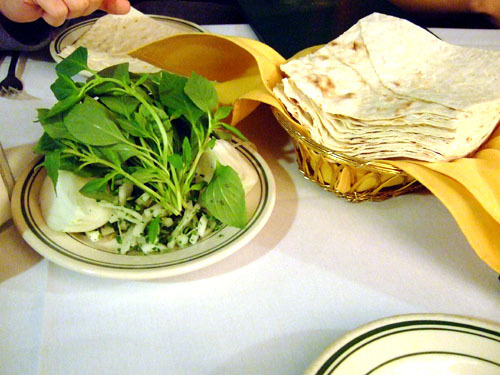 On the side are pieces of unleavened lavash bread and pats of butter (for the rice, not the lavash!). And by the way, the purple stuff in the shakers is sumac. 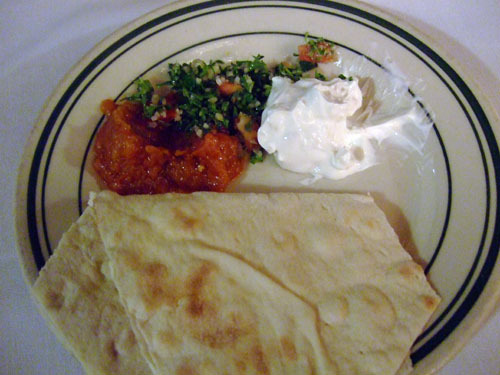 To go with the lavash, we ordered ikra (a roasted eggplant purée), tabbouleh (a mixture of bulgar, tomato, mint, parsley, onion, lemon, and spices), and must mousir (a yogurt dip with shallots, and also my favorite of the trio). 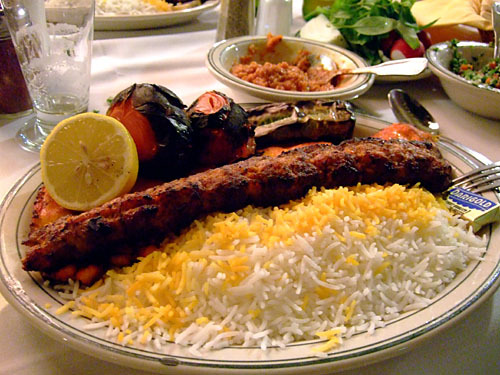 Marinated combination of chicken barg (boneless breast of chicken, skewered and charbroiled) and chicken koobideh (ground leg and breast of chicken mixed with special spices, then charbroiled) with grilled tomato & green pepper. Served on a bed of fluffy basmati rice. 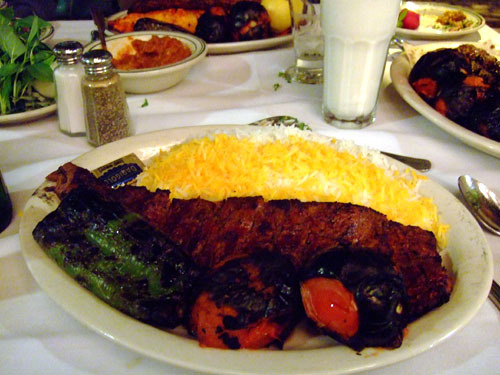 Both preparations of chicken were quite good, though I'd say I preferred the koobideh. 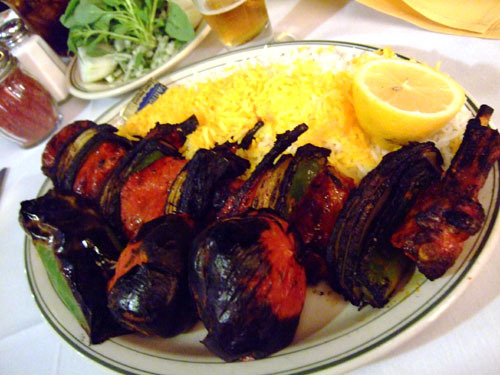 Filet mignon skewered and charbroiled to perfection with grilled tomato, bell pepper. Served on a bed of fluffy basmati rice. In my opinion, the weakest kabob of the night. The meat was a bit dry. 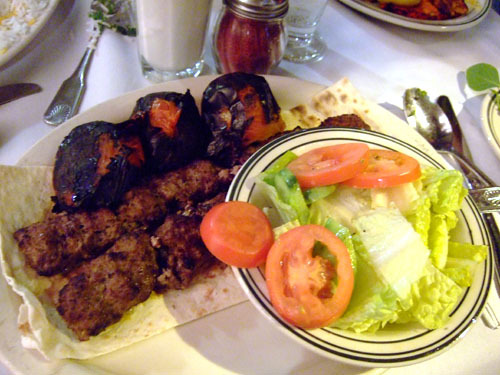 Lean ground beef, skewered and charbroiled with grilled tomato & green pepper. Served with salad. 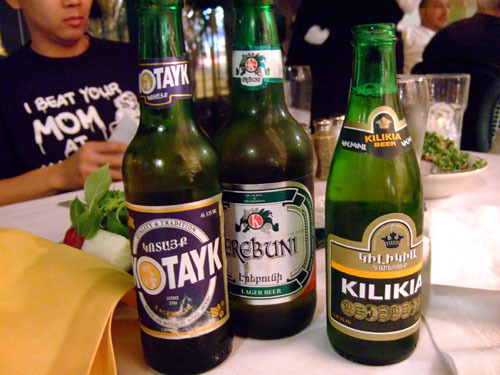 One of my favorite items of the night, this is what my Armenian group member ordered. Juicy. Succulent rack of spring lamb marinated & broiled with bell pepper & onions. Served on a bed of fluffy basmati rice. 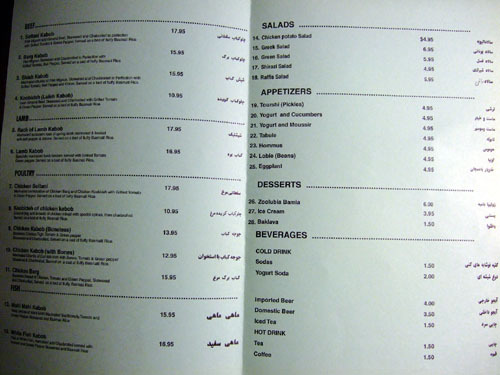 This is what I ordered. Really nice, the lamb was super flavorful and not too dry.